We normally hold stock of the entire manufactured range, from both Europe and the USA. Leather elements can be supplied in seals of built-up construction. 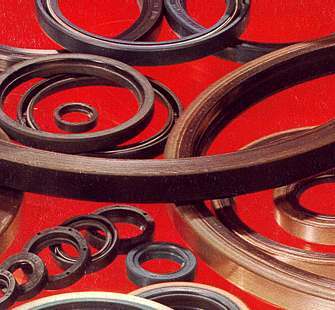 SEALMASTERS are able to supply seals to any size. Standard stock items cover both Imperial and Metric ranging from 3mm (1/8") diameter (used in medical equipment) to 1 metre plus (40"+) as used in rolling mills and cement works. We also carry a stock of popular non-standard sizes. Non-standard sized items can be made to order, again usually, with no additional tooling costs. This refers mainly to seals of built-up construction. Type A - Point contact single lip rotary shaft seal, with a rubber covered outside diameter and rear face. This style can accomodate split housings and housing bores where the surface roughness precludes metal to metal contact. Type AS - A semi-dual rotary shaft seal, incorporating a minor lip for dust /dirt exclusion, or corrosion protection. With a rubber covered outside diameter and rear face, this style can accomodate split housings and housing bores where the surface roughness precludes metal to metal contact. Type AHP - Point contact single lip high pressure rotary shaft seal, with a rubber covered outside diameter and rear face. This style can accomodate split housings and housing bores where the surface roughness precludes metal to metal contact. Suitable for pressures up to 10 bar. Type ASHP - A high pressure semi-dual rotary shaft seal, incorporating a minor lip for dust /dirt exclusion, or corrosion protection. With a rubber covered outside diameter and rear face, this style can accomodate split housings and housing bores where the surface roughness precludes metal to metal contact. Suitable for pressures up to 10 bar. Type AD - A bonded rubber seal incorporating two spring loaded elements for separating two fluids and suitable for use where space is restricted. The rubber covered outside diameter can accomodate housing bores with a surface roughness. Type B - Point contact single lip rotary shaft seal. Has a metal outer case and is not suitable for split housing assemblies. Type BS - A semi-dual rotary shaft seal, incorporating a minor lip for dust /dirt exclusion, or corrosion protection. Has a metal outer case and is not suitable for split housing assemblies. Type C - Point contact single lip rotary shaft seal. Has a metal outer case of built up construction and bonded sealing lip. Suitable for heavy duty applications. Type SS - A semi-dual rotary shaft seal, incorporating a minor lip for dust /dirt exclusion, or corrosion protection. Has a metal outer case of built up construction and bonded sealing lip. Suitable for heavy duty applications. Type BD - A metal outer-cased bonded rubber seal incorporating two spring loaded elements for separating two fluids and suitable for use where space is restricted. Type AB - A point contact single lip shaft seal of built up construction, using several component parts. Used when a more robust construction or larger seal diameter is required. This series is recommended. Type AC - A semi-dual rotary shaft seal, incorporating a minor lip for dust /dirt exclusion, or corrosion protection. Built up construction using several component parts. Used when a more robust construction is required. Type AT - A point contact single lip shaft seal of built up construction, using several component parts. Used when a more robust construction or larger seal diameter is required. 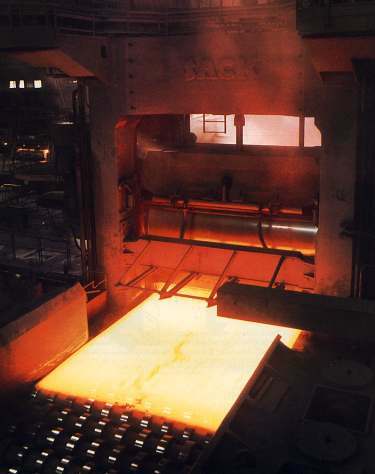 This series incorporates the Spring Kover design, and is recommended for use in all rolling mills. Type ATC - A semi-dual rotary shaft seal, incorporating a minor lip for dust /dirt exclusion, or corrosion protection. Built up construction, using several component parts. Used when a more robust construction is required. This series incorporates the Spring Kover design, and is recommended for use in all rolling mills. Type 1AY - A semi-dual rotary shaft seal, incorporating a minor lip for dust /dirt exclusion, or corrosion protection. Built up construction, using several component parts, arranged to give a more positive seal under arduous conditions. Used when a more robust construction is required. Type 2AB - Double Lip, Double Spring Rotary Seal of a built-up construction using several component parts with dual opposed rubber sealing elements. Suitable for separating two fluids. Used when a more robust construction is required. Type 2AT - Double Lip, Double Spring Rotary Seal of a built-up construction as Type 2AB, but with the inclusion of Spring Kover design sealing lips. Used when a more robust construction is required. Type 4AB - Double Lip, Double Spring Rotary Seal of a built-up construction using several component parts with dual rubber sealing elements arranged in tandem. More suitable for vertical shafts and head of oil applications where pressure is involved.